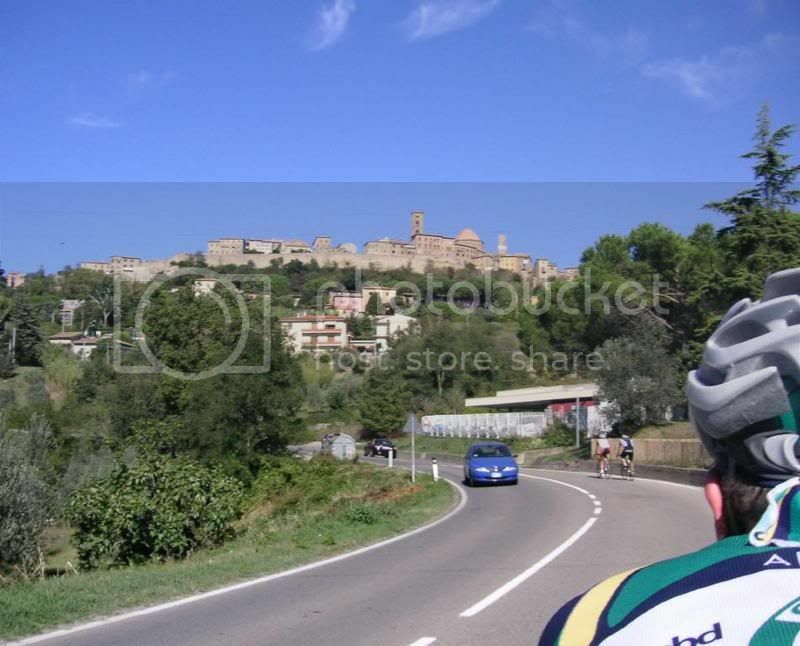 Tuscany Italy Vineyards as back drop on a tour of a castle. I love seeing everyone's photos! First photo is of us on the 2006 RAIN ride (Ride Across INdiana) - at about mile 110 of 160 on the way to the farthest we've ever ridden in one day 160 miles. The second is on the 2007 Tennessee Tandem Rally in part of a group. Third is a photo over my shoulder last fall in Brown County State Park, not far from Horseman's Camp Hill that made it into Bicycling's top 100 climbs. Fourth and last is a photo of us and Counselguy at a rest stop on the 2007 Southern Tandem Rally. Nice to be able to put some faces to folks on this forum! Ready to ride on the Canadian prairies. None with the wife on the bike, she has not had much stoker time between pregnancies and newborns. Missing are the wife and the baby. This is just after we got the Piccolo last Spring. We have since had a new trailer arm fabricated to level out trailer when attached to the Piccolo. I'll try to remember to update the photo in the next few months when my wife will be able to ride. Sorry, no pictures riding yet, but here is a picture of my lovely stoker and bike. And if you want to see our faces, here is the whole family without a bike. All have been my stokers from time to time, though the boys are generaly much less likely to take the back seat, and I mostly ride with my wife, Eukene. Forgot to place the pictures. 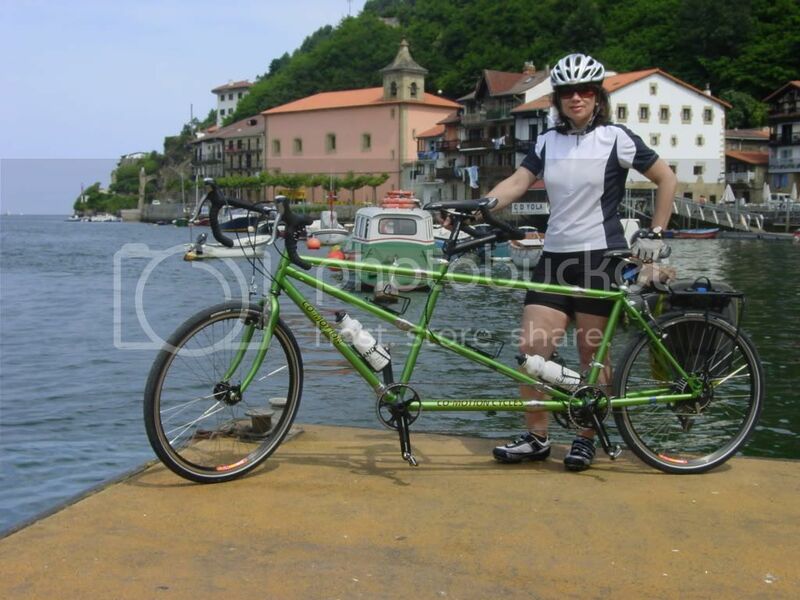 The tandem picture is in the entrance to the port of Pasajes, just outside of San Sebastian in the Basque Country of Spain. If any of you ever get there you must eat at the Camara restaurant which is one of the overhanging balconies over the water in the background. 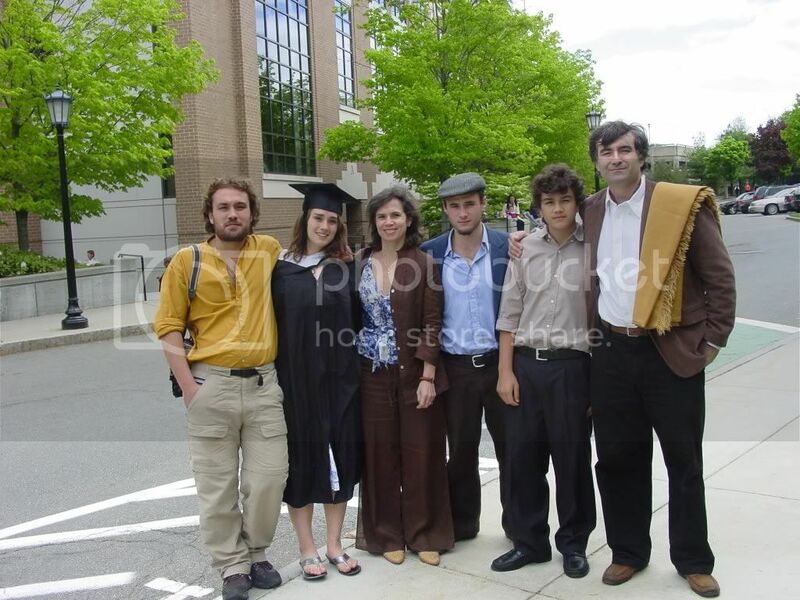 The family picture is our daughter's graduation in Boston College. As others have mentioned, it is great to put some faces to names. Here are a couple photos we took yesterday just for this. Joyce and I on our new Santana Beyond doing some antics. 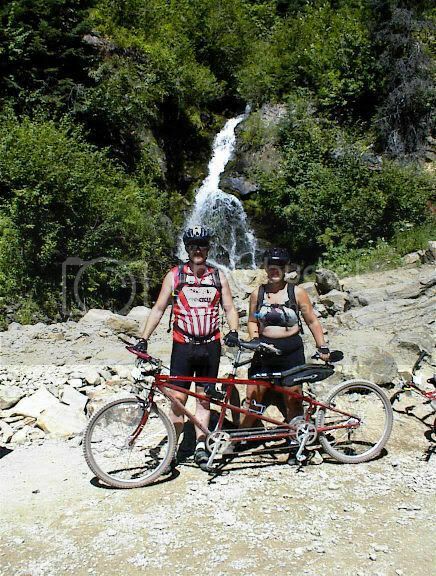 Second one is of friends Craig and Allison on a home built recumbent. Just a leasurly tour around the bay in San Diego. John and Katherine in front of a winery, March 2007. Russian River (northern California, Sonoma county, see wineroad.com) Barrel tasting event, the first 2 weekends of March (on now). Loads of fun and amazingly, no problems on the roads. Couldn't make it this year, but wanted to. Last edited by thebearnz; 03-01-08 at 10:36 PM. Going down in same Swiss Alps (in fact, it was much steeper than it appears in this picture! We may not look too happy, but we really are- we just managed to thread our way through a downhill crash where 20 or so riders went down in front of us during the Horsefarm 100 in Gainesville, Fl a couple of years ago. This is Renee and me today at the top of Mt Hamilton outside San Jose. A little over a week ago the Tour of California raced through here. It's a 4200 foot climb. This is Renee's first-ever bike ride to the top and it's our first ride to the top on our tandem. When this shot was taken it was 40 degrees and windy ... we were freezing!! And the descent was ahead of us -- a white knuckle bomb on the best of days. Those disc brakes got a massive workout today. She's feeling the climb today (as am I!!) but she's grinning ear to ear. The picture was taken in 2001 at the far end of the Hiawatha Trail's 1.6 mile long Taft Tunnel. It was taken in August with temps above 90 degs. Our day started at Idaho's Lookout Pass Ski lodge in which we rode 56 miles of rail trail and some really rough dirt roads. 17 miles of the ride was some pretty good climbing to include the 10 mile grind back up to Lookout Pass. It took us over 5 hours and we both went through our 100oz Camel Backs twice and a lot of Cliff bars. Even though it was a scrocher of a day the middle of the Taft Tunnel was 39 degs. 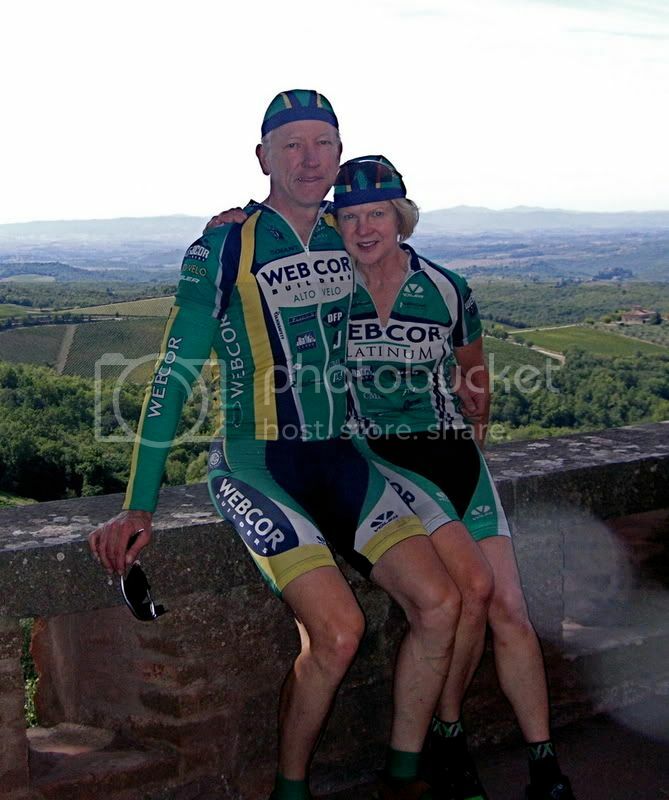 Sadly due to heart problems the wife hasn't riden the tandem in a few years. Debi and me riding one of our favorite events, the Georgia Tandem Rally. Last edited by Steve Katzman; 03-05-08 at 12:14 PM. My wife and I enjoying our time TWOgether. First picture was taken as we were cruising through the Highlands Hammock State Park here in FL this winter. Second is during the 2007 Sebring Tandem Weekend. Looking forward to the '08 Sebring event and also the GTR! Last edited by transam; 03-04-08 at 04:36 AM. Have enjoyed the pics..... We're riding past a farm in NC. Taken this past weekend, by taxi777. Riding down in San Felasco by Gainesville, FL. We just bought this bike last week, and here's our departure for our first ride together! 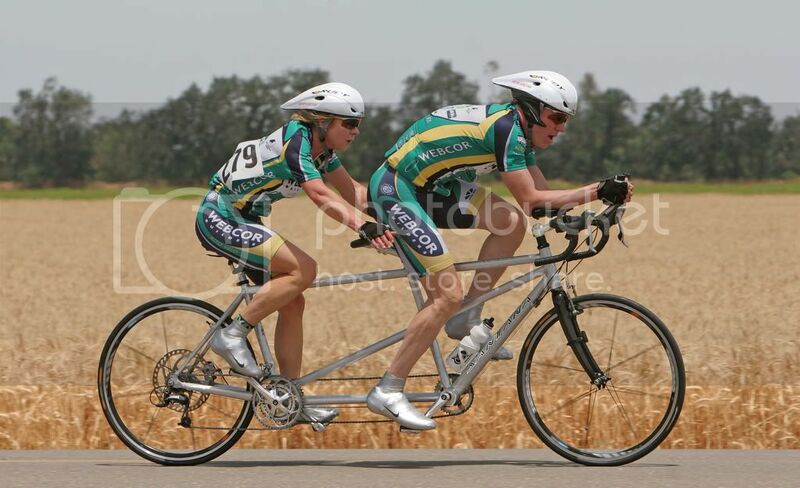 It's a Melton tandem, which we found on Craigslist in Mountain View California. Beautiful steel fillet-brazed Marathon style frame, 60cm/58cm c-c, red paint in nice shape except for a few scratches. It's equipped with Mafac levers and cantilever brakes, Arai drum brake, Phil 48h hubs, TA cranks, SunTour VX rear and Compe-V front derailleurs (3x7 with bar-end shifters). I'm presuming it was built before he joined Santana in 1982. It's our family's first tandem, joining our fleet of eight single bikes and two unicycles. I'd love to learn more about the history of the bike and its maker.